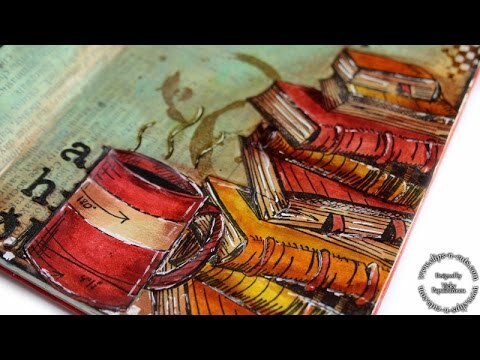 Here is another art journalling video by Vicky Papaioannnou for anyone interested. I loved watching that Video it was so interesting, clever, & very creative. It's so nice to lose track of the worlds proplems, & soak in Art & create an unique Art work, like in the teaching. The junk paper flowers are cool @Faith-and-Hope whoever made them is very clever! instructions online for making paper flowers @outlander, you just use pages from junk mail in place of other papers. Do you want to give it a go ? Is nobody doing any art these days? I note that this thread has remained dormant for a few months. Of course our resident artist @Faith-and-Hope has been overseas for 2 of those months. Does anybody have any creations they'd like to share? @outlander , you asked me last night if I do any drawing or other art. Here's one I did about a year ago, one I am quite happy with. I think I have others which I posted here some time last year. Not sure now though.